Cassie Carter grew up in a middle-class home with parents who loved one another and their three daughters and with an older and younger sister with whom she shared close ties despite sibling rivalry fueled by Cassie’s status as her father’s favorite. But at eighteen, with college on a four-year scholarship the next step in her life, a pregnant Cassie ran away to marry a man her father had forbidden her to see. Her husband insisted his job opportunities were better in Florida, about as far from her family’s home in Spokane, Washington as one could get. Instead of the happily-ever-after life of which she had dreamed, Cassie found herself trapped in a nightmare. Estranged from her family and isolated from her new community, she was left with no support system when her husband became physically abusive. Her daughter Amiee was seven when Cassie realized that her very life was at stake. Escaping with Amiee through the window of a locked bedroom, she found sanctuary in a shelter for women. After testifying against her husband and seeing him sentenced to prison, Cassie began to build a new life for herself and her child. Rejected by her family who knew nothing of all she had endured, she depended upon food stamps and government housing while she earned a certificate in cosmetology. Five years later, she has created a home for her and Amiee in a modest apartment in Seattle where Cassie works as a hairstylist and volunteers as a victim advocate at a local shelter. She still struggles to make ends meet, but she dreams of going to college and getting a degree in social work. Cassie’s life takes a turn for the better when she is approved for a Habitat for Humanity home and her older sister Karen contacts her. Although Karen is far from effusive when the sisters talk, Cassie is overjoyed with even a tenuous connection. Except for news of her parents’ deaths, Cassie has had almost no contact with her family since she left home more than a dozen years ago. Missing them has been a constant ache, and the possibility of providing her daughter not only with a new home but also the family Amiee hungers for seems to Cassie almost too good to be true. Reestablishing a relationship with her sisters is not easy. Old resentments and guilt linger. Cassie, who thinks her sisters have near perfect lives, has told them nothing about the reasons for her split from her husband, but they too are struggling with problems. Karen, happily married with two children, discovers that her husband has lost his job but is too ashamed to tell her, and Nichole, mother of a toddler, finds out that her husband is following the example of his chronically unfaithful father. Cassie is also forced to admit that her first impression of Steve Brody, a successful contractor who is her supervisor as she puts in her sweat equity for the Habitat for Humanity program, is wrong. Rather than the judgmental jerk he seems to be initially, he is a still grieving widower who proves himself a friend when Cassie needs one. Steve is interested in becoming more than Cassie’s friend, but even though the attraction is strong and Amiee approves of the match, Cassie’s past has left her fearful and determined to protect her independence. 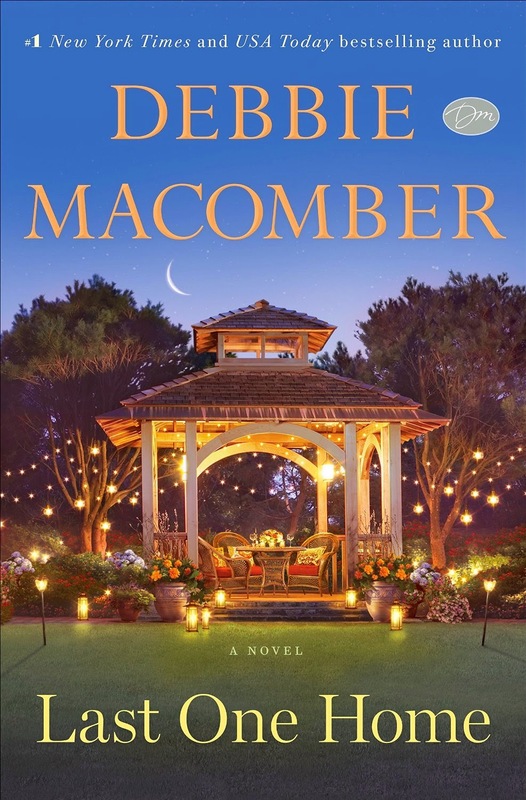 Last One Home is a rare standalone from Debbie Macomber whose popular series have made her a perennial on bestseller lists, but Ms. Macomber’s fans will find this story just as rewarding as her more usual fare. Cassie is a compelling character, and although the abused wife as heroine is a staple in romance and women’s fiction, Cassie’s lack of family and friends as well as her socio-economic status make her an exception. She stayed because she didn’t feel it was an option to leave. She had no job, no money, no friends, no connections. She was completely dependent on Duke, and for more than her and Amiee’s physical well-being. Emotionally she was tied to Duke, but those ties were like barbed-wire fencing, ties that brought her nothing but pain. Still, she hadn’t been able to find the courage to leave, not until it became a life-or-death situation. Her hard work, her love for her daughter, and her refusal to be defeated by her own bad choices in the past make Cassie an easy character to admire. Although her relationship with Steve gives the novel a strong romantic thread, Cassie’s struggle to give her daughter a safe and happy life and the renewal of sisterly bonds lie at the center of this story. Amiee with her eagerness to know more about her aunts and cousins, her enthusiasm for KFC, and her chatter about her BFF is an endearing and believable character, and the confining and defining family roles of childhood that complicate the reunion of Cassie and her sisters as much as their years of separation also has the ring of truth. If you are a Macomber fan, you will be happy with this book. Readers who like women’s fiction stories that focus on the triumph of a female protagonist over obstacles that would have defeated a lesser spirit will enjoy Cassie’s story. Last One Home is likely to add another title to Debbie’s Macomber’s long list of beloved books. Just finished this book and I did like it but at the beginning those sisters drove me nuts I thought they were so selfish but the story got better after that... I too would recommend the book. It will be nice to read a stand alone by her. Not that I dislike her series, but as with most series, I always feel I am missing something if I haven't read all the books in order. I like the sound of these characters and the story line. This will be one I will definitely read.